Two people were seriously injured in a crash near the intersection of East Stadium Boulevard and Ferdon Road in Ann Arbor this evening. Both cars had significant damage, and one occupant was trapped in the vehicle when emergency crews arrived, officials said. Numerous fire trucks, ambulances and police cars were on the scene of the crash Wednesday evening. 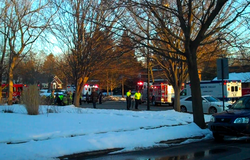 Ann Arbor police did not release details this evening of how the crash occurred. It appeared three vehicles may have been involved, but the third only had minor damage, witnesses said. Ann Arbor Fire Battalion Chief Kevin Cook said when firefighters arrived, a passerby was providing assistance. Firefighters had to force open the door to one vehicle to free the trapped driver, Cook said. No updated condition was available on the two people who were injured.